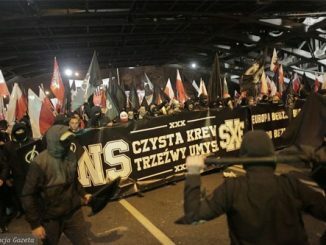 The annual Independence march (Marsz Niepodległości) took place in Warsaw on 11 November. Over 60,000 people attended, some of them masked and setting off red smoke bombs. Banners were carried with slogans supporting things such as a ‘white’ Poland and Europe and against refugees and Muslims. Some demonstrators wore the Celtic cross or the pre-war fascist symbol (the falanga). Representatives of other far-right parties in Europe attended the march, with the former leader of the English Defence League, Tommy Robinson, boasting that he ‘had an amazing time with polish patriots marching against Islam’. The following article by Gavin Rae, on the elections to Poland’s parliament, was originally published by transform! The recent parliamentary elections in Poland were historic, although unfortunately for all the wrong reasons. For the first time since 1989 a political party in Poland has won an overall majority in parliament, with the conservative nationalist Law and Justice Party (Prawo i Sprawiedliwość – PiS) winning over 37 per cent of the vote. Also for the first time in history, the left will have no representatives in parliament, meaning that Poland is presently the only country inside the European Union where there are no left MPs. While governing parties throughout Europe are losing elections, Citizens’ Platform (PO) has been re-elected as the largest party in Poland and will again form a coalition government with the Peasants’ Party (PSL). 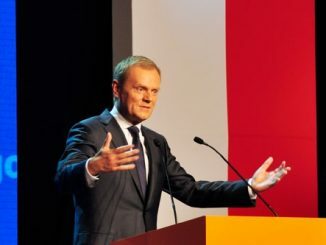 The major reason for its victory is that the Polish economy has continued to grow throughout its term in office, with Poland being the only EU country to have avoided a recession since the outbreak of the global economic crisis.